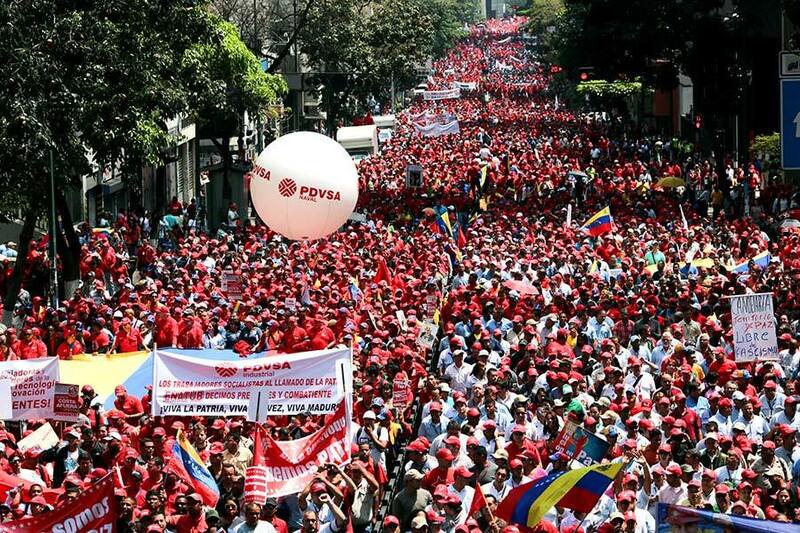 Hundreds of thousands march against US-backed destabilisation in Venezuela. For those of you unfamiliar with Venezuelan issues, don’t let the title of this article fool you. The revolution referred to is not what most media outlets are showing taking place today in Caracas, with protestors calling for the ouster of Venezuelan President Nicolas Maduro. The revolution that is here to stay is the Bolivarian Revolution, which began in 1998 when Hugo Chavez was first elected president and has subsequently transformed the mega oil producing nation into a socially-focused, progressive country with a grassroots government. Demonstrations taking place over the past few days in Venezuela are attempts to undermine and destroy that transformation in order to return power to the hands of the elite who ruled the nation previously for over 40 years. Image: East African political youth leaders pose for a photo after attending a workshop organized in 2009 by NDI and KIC at Kunduchi Beach Resort in Dar-es-Salaam. In a 2010 science fiction action film, Inception, Leonardo DiCaprio plays an exceptional thief whose specialty is to extract valuable commercial information from the minds of tycoons. Like a hacker who penetrates computer systems and secretly accesses data, DiCaprio enters into the subconscious of his targets and digs out their secrets as they dream. His excellent espionage skill prompts a wealthy businessman to use him to bring down the business empire of a competitor. Thus DiCaprio embarks on his toughest mission ever, this time not to steal an idea, but to plant one in the mind of the competitor that should drive the target to destroy his own business empire. In real life and in Africa particularly, western organizations are busy playing DiCaprio by indoctrinating whoever they expect to gain political influence sooner or later. Their goal is to make the next generation of African leaders receptive to western whims and caprice. Prominent among such organizations is the International Republican Institute, National Democratic Institute, Christian Democratic International Center, Friedrich-Ebert-Stiftung, and Konrad-Adenauer-Stiftung. These organizations, ideologically dissimilar as they may claim to be, have a common agenda of entrenching and perpetuating western subjugation of Africa. Their capacity to posture as innocent apostles of good governance, democracy and human rights – concepts that the West defines and twists according to its interests – makes them the least suspected of Euro-American strategies for global dominance. Egypt has denied licenses to eight US-based non-profit groups, saying they violated the country’s sovereignty. Many states are concerned that foreign government-backed NGOs are really agents for their sponsors, rather than independent action groups. ­Among the organizations banned from continuing their work in Egypt are the Carter Center for Human Rights, set up by former US President Jimmy Carter, Christian group The Coptic Orphans, Seeds of Peace and other groups. Egyptian authorities warned that if the NGOs try to work without a license, Cairo would “take relevant measures”. Local media speculate that the rejection may be temporary, and licenses could be granted later, after the presidential election due on May 23 and 24. Monday’s move revives a crackdown by the Egyptian authorities on foreign-funded NGOs, which recently provoked a serious diplomatic row with long-term ally US. In late December 2011, security forces raided offices of a number of groups suspected of receiving money in violation of Egyptian legislation. In February, prosecutors charged 43 people with instilling dissent and meddling in domestic policies following last year’s mass protests, which resulted in the ousting of President Hosni Mubarak. 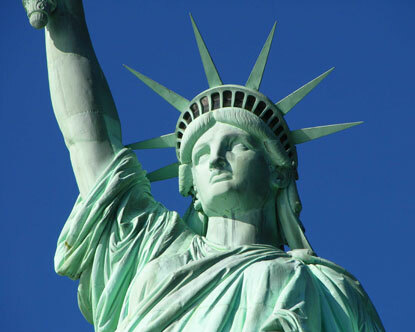 Among them were citizens of the US, Germany, Serbia, Norway and Jordan. 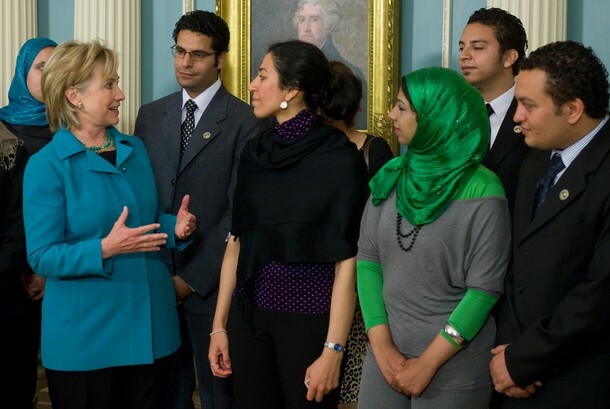 Photo: US Secretary of State Hillary Clinton speaks with “Egyptian activists promoting freedom and democracy”, prior to meetings at the State Department in Washington, DC, May 28, 2009. Source: Part I: Occupy Wall Street and “The American Autumn”: Is It a “Colored Revolution”? Egypt’s ruling military council has rejected US threats to end aid payments to the country. US-Egypt tensions have risen considerably following the decision to refer 43 civil society workers to a Cairo court on charges of violating laws regulating the operation of non-governmental organisations (NGOs).